This was director Cameron's ticket into the Hollywood big time (quite a leap from Piranha 2 Flying Killers!). His innovative tale greatly boosted by the muscular Arnie sees a man return from a future where robots have taken over the planet, eradicating humans everywhere. He has to protect Sarah Connor (the mother of the as yet unborn resistance leader John) from a cyborg sent back in time by the machines to exterminate her. With a limited budget, the filmmakers made the best of it and convincingly so, especially with Stan Winston's pre-digital era FX. Arnold's title role also fast tracked him from an Austrian muscleman who played B-roles like Hercules to an A-list Hollywood hard hitter. 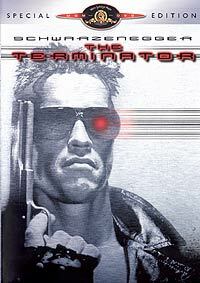 The Terminator is an irresistible classic creating a new (much immitated) sci-fi genre. The double disc DVD special edition includes a retrospective, a documentary, deleted scenes, various trailers, artwork stills, several picture galleries, plus a DVD-Rom segment with various development drafts of the script. Subtitles come in a dozen languages. PS. The film features Cameron regular Bill Paxton in a small role as one of a gang of punks who get on the wrong side of the determined Terminator.